Quickest program launcher that is activated by both mouse buttons pressing. MouseLaunch 4.7 is launchers & task managers software developed by UInterface. 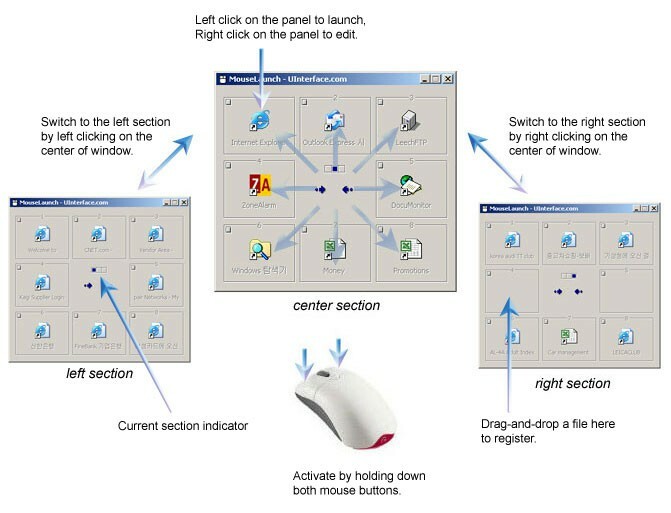 MouseLaunch is a quickest program launcher that is activated by one mouse gesture. 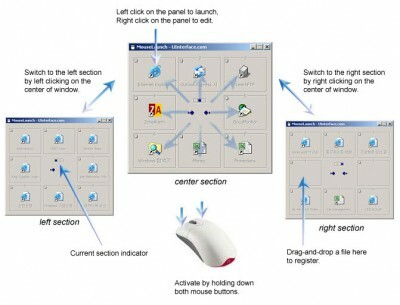 MouseLaunch uses a built-in unique technology of detecting both mouse button pressing and it enables the complete new user interface of using mouse and launching programs. Drag-and-Drop registration, Multi-Section support, Special Panel support is the key features of MouseLaunch. In this version, faster section shifting, improved activation added. This program is shareware, which means you can download and use MouseLaunch 4.7 for free during 30-days trial period. After this period you gonna have to buy MouseLaunch 4.7 software for $24.00 or uninstall the program. MouseLaunch 4.7 supports different languages (including English). It works with Windows XP/Vista. Latest MouseLaunch 4.7 does not contain any spyware and/or advertise modules, allowing installing it with no worries concerning valuable information loss. Our website has thoroughly tested system utilities product MouseLaunch 4.7, written the review and uploaded installation file (631K) to our fast server. Downloading MouseLaunch 4.7 will take several seconds if you use fast ADSL connection. A free file launching utility from Intrepid Mouse. xGestures is a shareware program for Mac OS X 10. Easy to use, yet feature-rich FTP tool with Drag'n'Drop and firewall support. Lock your mouse and PC. Use your mouse wheel in any Windows application.